Whether you’re a full-time, heavy duty contractor or a do-it-yourself weekend warrior, a cordless drill is an essential tool to keep in your tool shed. From assembling furniture to building outdoor decks, here are the best cordless drill sets to tackle any project. We will cover a range of 12V to 20V power drills, so you can find the best one to fit your need. Performance- RPM ( Rotation Per Minute) is one of the key factors to look for when shopping for a cordless drill. The higher the RPM , the quicker your drilling gets done. There are specific tasks where RPM should not exceed a particular range, for instance – when drilling through thin or low density glass, RPM of less than 450 is preferred. If your job requires handling such delicate materials, look for adjustable RPM settings in your drill, you can find the best one. Battery- Battery capacity determines how long one can use the cordless drill before stopping for recharging.The factors to be considered are voltage and ampere capacity of the battery pack. Higher volatage usually provides for a more heavy duty drill. A higher ampere capacity of the battery pack means more work could be done with a single charge. Drills usually range between 12V and 20V power drills, so you can find the best one to fit your need. Pricing- Just as important as how usable a specific product is for you, is the how heavy the cost of a drill will be on your budget. Pricing can range from just $35 to a whooping $500. Choose according to your needs. This 18V cordless drill is a tough and proven product, capable of tackling heavy-duty projects. 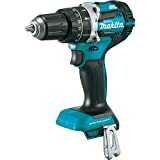 Priced at $119 on Amazon, the Makita cordless drill features a 4-pole motor, capable of delivering 400 in.lbs. of max torque. It also features Makita’s “Extreme Protection Technology” (XPT), which protects the drills from dust and water that is common in harsher working conditions. Weighing in at 4 lbs., this tool is also light and easy to handle. The Makita 18V drill can be purchased for $119 with a case and battery charger, or with a 70 piece bit set for $141 – a great value for a powerful product. Bottom line:This drill is great for heavy-duty projects in any work environment, but if you are working with material like concrete, look for something that delivers more torque than the 400 in.lbs. this drill delivers. 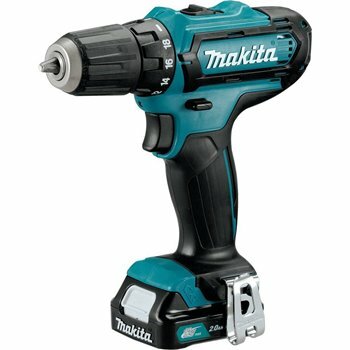 Another powerful tool from Makita, this time in a 12V cordless drill. Smaller than the 18V LXT drill, the 12V CXT drill is still very durable and capable of performing every-day DIY projects around the house like building furniture and hanging shelves. The smaller, extremely compact design (weighing in at a mere 2.4 lbs.) makes it very easy to handle and store. The motor delivers up to 250 in.lbs. of max torque, making it perfect for drilling, fastening, and driving. 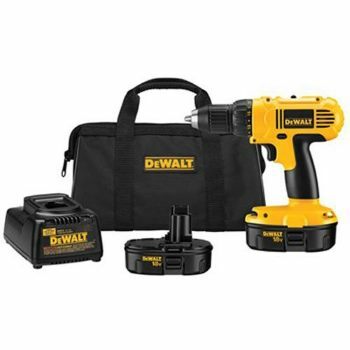 For $119, this drill comes with 2 lithium-ion batteries and a carrying case. You can also purchase it with a 38-piece bit set for $135. 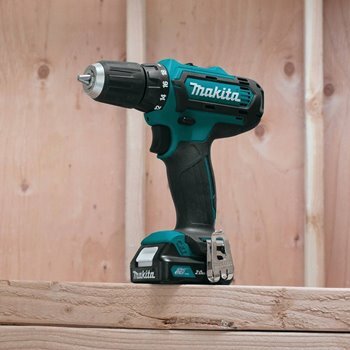 Bottom line: The Makita 12V drill is a very convenient drill to keep around the house for everyday tasks like building furniture and hanging wall designs, with a compact design that’s hard to beat and can be used by anybody. Hitachi has also made a name for itself in the cordless drill market. This 18V drill is very light at 3.5 lbs., yet offers 460 in.lbs. of torque, surpassing Makita’s 18V drill. The drill offers a ½ inch ratcheting chuck for easy bit changing, a handy LED light, and a belt hook, making it one of the most worker-friendly drills out there. At $130, this drill also comes with an LED flashlight for use in darker conditions. For $158, you can buy it in a 120-piece drill set. What’s particularly nice about the Hitachi cordless drill is that it comes with a 10-year warranty for the tool and a 2-year warranty for the a battery, offering you peace of mind while at work. Bottom line: You won’t find many drills that are so compact, yet deliver this much torque. This can tackle just about any project. The 120-piece set is also a bargain. This 20V cordless drill by Dewalt is a beast. While offering 20V of power, enough to take care of the most challenging tasks, this drill weighs only 4 lbs. This drill features 2 speed settings (0-450 and 0-1,500 rpm) and a single sleeve ratcheting chuck which will firmly keep any drill bit in place. The 20V motor delivers 300 watts of power, making it capable of a wide range of construction projects. This kit $99 comes with 2 lithium-ion batteries, a charger, and a case. Ratcheting chuck does a great job of keeping bits in place through any task. Lightweight while delivering tremendous power for heavy-duty tasks. Battery life – tends to hold around 12 months. Bottom line: This cordless drill is a no-nonsense workhorse that is capable of tackling any jobs. For $99, this is a bargain and should be considered by light to heavy-duty users. 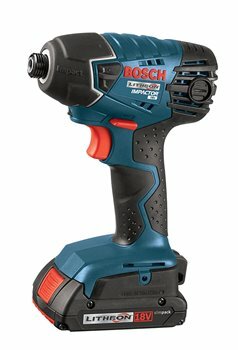 Similar to the Milwaukee compact drill set, Bosch also offers a great 18V drill and driver kit. This is a ½ inch drill that is very compact (7 in. in length, weighing 3.5 lbs. ), making it easy to handle and use by anyone. The driver is a ¼ inch hex impact driver that is one of the most powerful in its class, delivering a whopping 1,500 in.lbs. of torque. This can rip through any material from wood to metal. Because of the tools’ light and compact design, they are easy to carry and perfect for overhead drilling and working in tight spaces. They also feature an LED light for illuminating dark work environments. 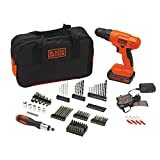 While this one of the most powerful drill and driver set, we placed it at #10 on our list due to the hefty $200 price tag. 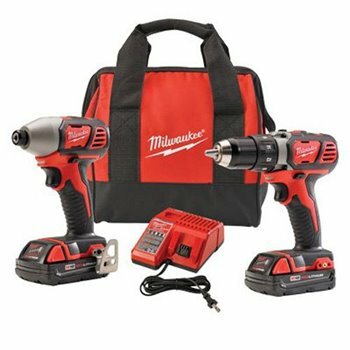 Like the Milwaukee kit at #5, this bundle comes with the drill, driver, 2 batteries, charger, and carrying case, without the 5-year warranty. 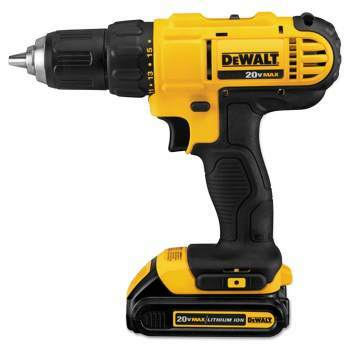 Comes with a cordless drill and an impact driver, both with 2 speed setting for versatility. Impact driver delivers 1,500 in.lbs. of torque, enough to tackle the heaviest tasks. Not accessories beyond the drill, driver, case, and charger. Bottom line: This drill/driver set is one of the most powerful on the market and ideal for professional use. 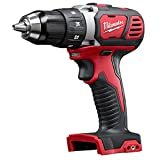 While the price is a bit steep compared to other 18V drills, this comes with both a drill and a driver that are sure to live up to the price tag. 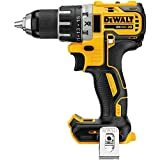 Dewalt’s 18V drill model, while offering less power than their 20V drill, is still capable of handling a very wide range of jobs including hanging shelves and drywall. The drill body is more compact than the 20V, making it easy for any user to handle and use without fatigue and with great precision. 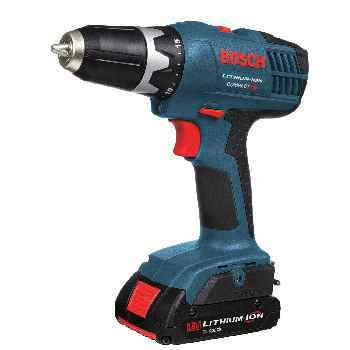 The batteries for this drill are NiCd and reach a full charge in only 1 hour, so you can take of any task at any time. The drill with 2 batteries is priced at $89, and a 45-piece set can be purchased for $104, making this product a great cordless drill for the money. Fast-charging batteries (charges in 1 hour). Good quality for a relatively low cost. NiCd batteries make this drill heavier than lithium-ion drills. Will have a hard time with heavy-duty jobs and materials. Bottom line: This is a great, versatile drill for lighter duty tasks like building furniture and hanging shelves. For $89, it’s also relatively cheap, yet good quality. Milwaukee is a fan favorite in the world of construction, and they continue to deliver with this set that includes both an 18V compact cordless drill and and impact driver. The set is sold by various sellers on Amazon, starting at $166. The drill weighs just 4 pounds, but delivers 400 in.lbs. of torque. The impact driver houses a 4-pole motor capable of delivering an incredible 1,400 in.lbs of torque. The drill and driver also feature a bright built-in LED light for darker working conditions. The set also comes with 2 batteries, a charger, a carrying case, and a 5-year warranty on the tools and batteries. While on the pricier end, you get both a drill and a driver that are the most powerful on the market and capable of tackling light to heavy-duty jobs. Impact driver delivers 1,400 in.lbs. of torque, capable of driving through any material. Features an LED light for dark working conditions. Not the longest battery life out there. Bottom line: This is a great combo that can handle anything from everyday DIY projects to heavy-duty construction tasks. The drill and driver combo ensure you have the right tool for any task. 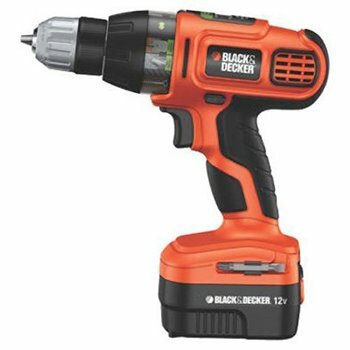 At just $35, The Black & Decker 12V cordless drill is the perfect tool to have around the for everyday household fixes. Users rave about the drill’s battery life and how easy it is to use. 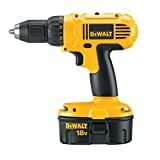 If you are not a professional handyman or heavy-duty construction worker, this is one of the best cordless drills for doing things like hanging pictures and putting together furniture. This drill is even capable of drilling through plastic and metals. Not an ideal drill for heavy-duty jobs. great to have around for everyday projects and fixes around the house. Black & Decker continues to bring the most value to its customers with another 20V cordless drill kit, this one priced at $74 on Amazon. The drill itself is powered by a lithium ion-battery and features an 11-position clutch to prevent over-driving or stripping screws. This is a great cordless drill for any project around the house from building furniture to hanging drywall. It also comes equipped with an LED light. What sets this particular drill set apart is the included accessories. Not only do you get a battery, a charger, and variety of drill bits like almost all other sets, but you also get other handy construction tools like a hammer, screwdrivers, wrenches, and more. If you’re looking for a great all-around new toolkit, this is the one for you. An all-in-one tool set that also includes basic tools like a hammer, screwdrivers, wrenches, and more. 20V offers power that can drill through tougher material. Not the most powerful 20V drill on the market. May have some trouble with heavy duty tasks like drilling through concrete. 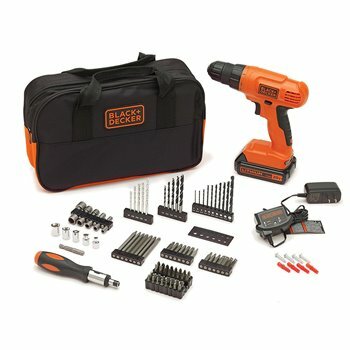 Bottom line: This is a great drill set for someone looking to buy a brand new complete toolkit for tackling any day-to-day fixes around the house. If you are looking for a cordless drill kit that offers the most bang for your buck, this one is tough to beat. Listed at $120, Amazon offers it for $81. That includes 20V MAX cordless drill with 100 accessories including one lithium ion battery, charger, case, and assortment of drill bits. With 20V of power, this drill can drill and drive through wood, plastic, and metal. However, the torque reaches 300in.lbs. (as compared to the 400 or 450 you can get from the Makita or Hitachi 18V models) so this B&D cordless drill is perfect for tackling light medium-duty tasks, but may be tougher to use for heavy-duty construction jobs. 2-3 hours battery charging time. Drill set includes only 1 battery. Bottom line: You get good value for your money with this 100-piece cordless drill set. Great for household maintenance, but not built for tougher projects. Makita is a power tools manufacturer headquartered in Japan. The company was founded in 1915 by Mosaburo Makita . It began selling power tools, alongside motors and electric transformers. 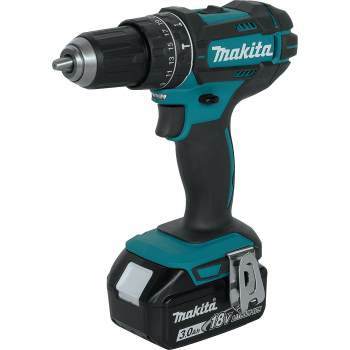 Makita has cutting edge technology producing highly crafted tools.They were the first to introduce battery powered drill to the market during the late 90’s. Dewalt is an American manufacturer of hand and power tools. The company was established in 1923 by Raymond E. DeWalt, and was sold to Black & Decker in 1960. Currently DeWalt is a trade name of Black & Decker (U.S.). Apart from manufacturing power tools, DeWalt launched a line of contractors’ hand tools including utility, knives, pliers, adjustable wrenches, tape measures, saws and hammers. The Company was founded during 1920’s by A. F. Siebert. It has its headquarters in Brookfield, Wisconsin. It produces corded and cordless power tools, hand tools, trims, knives, screwdrivers, and tool combo kits. It also manufactures an array of various measuring devices such as digital voltmeters, temperature monitors, lightning testers and compress meters. Bosch , the world’s largest supplier of automotive components, was founded by Robert Bosch in 1886. The company headquarters are in Germany, but it is prominent worldwide. Its primary products are related to the automobile industry such as brakes,controls, electrical drives, electronics, fuel systems, generators, starter motors and steering systems. It also manufactures household appliances, high quality power tools and security systems. 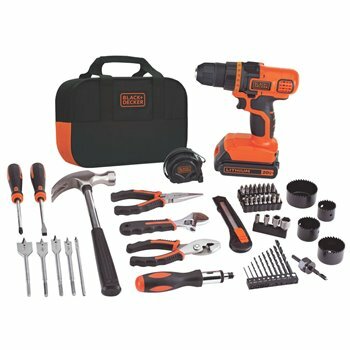 american looking to buy a power tool. Since its inception, this brand has been accredited many awards. In 1917 it received the patent for a pistol type trigger switch which is produced even today by many brands. Hitachi Ltd is a diverse company that operates several businesses which includes consumer product electronics, as well as construction machinery. It was founded in 1910 in Japan by Namihei Odaira, and is headquartered in Tokyo. 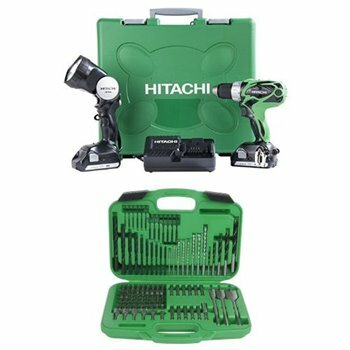 All of Hitachi’s product are well known for their high grade craftsmanship, innovative design and usability, just to name a few. Today’s power tool industry is very competitive. Every product made by every brand has its own edge over the other. There is a very wide range of brands and products to choose from according to your needs, so you can be sure to make a good choice after careful research.